Tel Aviv's Chinese food still hasn't developed that much. 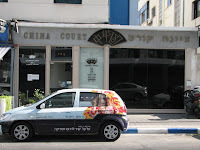 China Court also misses the Asian bustling atmosphere and noise which are typical for Chinese restaurants outside Israel. Yet this place is considered as the most authentic one (food wise) by Chinese people who live in Tel Aviv. China Court has the usual Chinese menu - eggrolls, chicken, beef, pork, duck, seafood and vegetables cooked with different sauces. Like many other Chinese restaurants, this place also uses ready-made sauces, so don't expect too much. We do like to recommend on the lemon chicken, pancake duck (fried duck served with a sauce and pancakes to roll it), Szechuan tofu and the broccoli (which is a bit pricey but good). You can go down on Bograshov (which is connected to King George) and then turn left on Ben Yehuda, it's in front of the El-Al building (15 min walk). If you are on Allenby, Ben Yehuda is connected to it, so keep on going straight until you get there.